Turkey has long been on the verge of the European Union. About the European future of the country which is located between Asia and Europe half a century ago talked Adenauer and De Gaulle. In 1999, Turkey received the status of a candidate for EU membership. However, since then a lot has happened in the EU, many other countries entered EU, yet Turkey is still in the hallway. Apparently, the high-flown phrases of EU officials that "Turkey is a country which can not be ignored", which "has become a valuable element for Europe`s competitiveness" is not so much inspiring rather than annoying the public on both sides. The negotiation process between Brussels and Ankara, which was for decades under the pressure of a series of political, economic and other issues, was "crushed" also by large-scale economic crisis in the EU. And, as with any crisis, the current situation in Europe has stimulated not only the European politicians to seek a way out of the economic stagnation for the Old World, but also makes rethink some aspects of (if not the whole paradigm) the European integration project. In these circumstances, the question of Turkey`s accession to the EU cannot be left aside. Speaking about the EU, it is worth to be always mindful about complexity of such subject of international politics, since among its constituent countries it is not always possible to find the necessary consensus, including the Turkish question. Of course, today in the atmosphere of existing European crisis many in the EU depend on the political will of Germany as the economic leader of the Union and the country that has become "second home" for several generations of Turks. However, with respect to the traditional Turkish issue many things have depended also on another EEC / EU leader, who is active on foreign policy agenda of the Union - France. With the birth of EEC France is actively working on the integration of the communities around its foreign policy positions (in the name of such leaders as Charles de Gaulle, Giscard d`Estaing, and Mitterrand). These attempts positively (by Chirac) or negative (Sarkozy) influenced relations between Brussels and Ankara. Studying the history of the issue, it is impossible not to draw attention to a certain discrepancy in the perception of both Europe and Turkey of mutual integration process. The parties which have centuries-long experience of neighborhood certainly have both demand and supply interest in each other (both economically and politically). On the hand, Turkey has no shortage of declarations of loyalty to the Europe for its close connection of historical destinies of the two sides of the "common house" and a joint future. As strong arguments such facts can be stated: Turkish foreign trade is oriented to euro (37% of revenues come from EU countries, 70% of foreign direct investments come from the EU) and the participation of Turkish troops in the peacekeeping operations of the EU (in Bosnia and Kosovo). In response the EU, as a rule moving from lyricism to dry figures and recalls that "in the interests of the EU and Turkey is to give a new dynamic to accession negotiations" to ensure that "the EU will remain a reference point" for Turkish reforms. And though to reduce the relationship between the two partners to the formula of "one gate game" (for instance Turkey is knocking on the door and the EEC / EU comes up with how to influence on Ankara, while keeping it at a distance from the European family) is not quite correct. Still, a certain tendency towards unilateralism was present initially. History states that the main initiatives (such as application for establishment of an association with the EEC in 1959, the association establishment in 1963, the application for accession to the EEC in 1987) came from Ankara. The EEC members gave an answer (for instance, in the 1963 Agreement on the issue Turkey`s integration to Bigger Europe in general was deemed unnecessary): it was more about promoting the continuous and balanced strengthening of trade and economic relations between the parties and taking into account the need to ensure the accelerated development of the Turkish economy and to increase employment and living conditions of the Turkish people, that is the purpose of which in general quite suited to Europe. The question whether Turkey had a chance to reclaim more in the realities of the Cold War is very complicated. In any case, during the French President Charles de Gaulle`s (1958-1969 years of presidency) official visit to Turkey in 1968, the latter preferred to talk about cooperation and the independence of the Turkish Republic, but not about integration. Moreover, the Greek-Turkish conflict in 1974 over Cyprus has suspended all cooperation mechanisms on both sides keeping away the prospect of further rapprochement of Ankara with the EEC. The application for full membership in the EEC submitted by Turkey in 1987 came to the end of the Cold War. The unification of Germany, Velvet Revolutions of 1989-1990-ies, and collapse of the Soviet Union in 1991 transformed the Europe into setting new goals in EEC to further deepen and expand EU. In these circumstances, the idea of accepting Turkey into the EEC is set aside. The official response of the European Commission in 1989 on the request sounded negative: specifically to demand from Turkey to resolve the Cyprus conflict with Greece, a member of the EEC since1981 (which blocked a package of financial aid provided by the Community for restructuring the Turkish economy within the association) and to ensure human rights, including the rights of national minorities. Then EU put on the agenda of the requirements for Ankara to recognize the fictional Armenian genocide. At the same time concerned about the stabilization of its southeastern borders (the lessons learned from the Yugoslav crisis), the EU could not afford to alienate Turkey. Francois Mitterrand (1981-1995 years of presidency) arriving in Turkey called for increasing cooperation with the countries of the EEC in the framework of the association, but said nothing about the possible accession. An attempt to resolve the situation was an agreement signed in 1995 on the Customs Union of Turkey and the EU. A document in its own way was unprecedented one. Turkey was the only country to have customs union with the EU, without being a member. It was a serious restriction on the principle of national sovereignty, despite the fact that the EU has not committed itself to the adoption of Turkey. Of course, for the European Union the agreement was very favorable: European products being more competitive received more duty-free access to the Turkish market. In Turkey, this event was assessed in different ways: if the government filed an agreement as a success with a view to full membership in the EU (as a result Turkey got the opportunity to showcase itself as a reliable partner by preparing their products to the tough competition with European products. The opposition pointed out that Turkey received neither of any EU market nor the opportunity to influence the decisions of the EU in the field of trade, no guarantees for further integration with the EU, but is guaranteed to erect barriers to trade with third world countries. In the first year of the Customs Union Turkish imports increased by 37.2%, while exports - only 4.2%. At the same time in the EU it had $ 11.6 billion trade deficit of the country. Further efforts have allowed Turkey to storm another step of the European ladder: in 1999 at the European Council in Helsinki, the Turkish Republic became an official candidate for EU membership, together with 12 other countries. Turkey has supported Jacques Chirac (1995-2007 years of presidency) who declared in July 1995 at the European Parliament the following: "Europe must spare no effort to support and understand the Turkish government which wants to move towards our values." 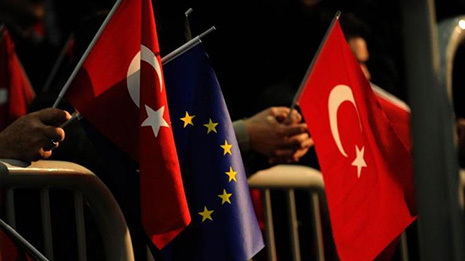 In December 2000, France as chair of the EU Council signed an agreement with Turkey on the preparation of the program of Turkey`s accession to the EU. It seriously stimulated Turkey to carry out democratic reforms (such as abolition of the death penalty; the Kurds are recognized as a national minority, allowing the transmission and teaching of the Kurdish language, and so on.). In 2004, the EU Council acknowledged that Turkey sufficiently meets the Copenhagen Criteria for EU membership. In 2005, the country starts accession negotiations on specific areas of acquis communautaire (EU standards) together with Croatia. However, re-aggravated crisis of Cyprus (mainly Turkey`s refusal to apply the rules of the Customs Union to the Republic of Cyprus to join the EU) has forced Brussels to freeze the negotiation process. Moreover, Jacques Chirac has demanded that Ankara recognition of the so-called Armenian genocide directly related to the issue of Turkey`s accession to the Union. All this could not pass without affecting the vote on the draft resolution for new European Constitution, that failed well in France and in the Netherlands in 2005.: European integration reached a deadlock. The new president of France, and the mastermind of the Lisbon Treaty in 2007 Nicolas Sarkozy (2007-2012 years of presidency) paired with German Chancellor Angela Merkel even said they did not see Turkey in the future Europe, offering in return the Turkish membership in the Union for the Mediterranean Area along with such countries as Maghreb and the Middle East. Sarkozy not bothering to search diplomatically correct words explicitly said that the prospect of Turkey`s accession to the EU seems to him absurd. "Strategic hopes that underlie the intentions can be carried out in the framework of a strategic partnership agreement. It seems that Europe does not want to abandon promises formulated in 1963 in the geopolitical context, which have nothing to do with the current ones" - he stressed. In 2011, Sarkozy struck in Ankara only five hours during the working visit, reiterated: "I am still convinced that Turkey and the EU should have closer relationship, but do not bring them to the level of integration: it does not go for the benefit of both Turkey and the EU". Not surprisingly during Sarkozy presidency French companies lost their share of the Turkish market (it was reduced from 6 to 3%), and Turkey spoke about Islamophobia and Turkophobia blooming in Paris. Of course, it could not inspire Ankara especially since the events of the Arab Spring in 2011 actually frozen (if not only buried) this project. Disappointed by this trend the Turkish Prime Minister Recceb Taib Erdogan publicly announced in October 2012 that if the Turkish Republic will not be accepted in the EU before 2023, it will withdraw its application. President Abdullah Gul reacted differently. "For us, the European Union - is a strategic goal. But even if we manage to bring the negotiations to end, it does not guarantee our entry" - he sadly stated at a press conference with French President F. Hollande, whose election has given the Turks hope to alleviate the position of Paris and Brussels. However, cautious Hollande did not promise anything, noting only that the matter will be decided in a referendum by the French popular voting, and that Turkey will not join the EU for at least the next five years. Abandoning the Sarkozy aggressive rhetoric Hollande has still called on Turks to recognize the Armenian genocide and to ensure an independent justice and human rights. Trying to get out of the negotiations impasse in 2013, when Croatia became the 29th member of the EU, Turkey has signed an agreement with the European Union only on the issues of migrants. In January 2014, the Ifop company conducted a survey among the French and citizens of neighboring countries to find out their attitude towards Turkey`s accession to the EU. These surveys are conducted on a regular basis, but the results clearly show of this very survey that strong aversion to Ankara in Western Europe exists today. Against Turkey`s EU expressed 83% of French, 72% of Germans, 68% of Belgians, 66% of Britons and 50% of Italians. Only in Spain, the majority (56%) supported the idea of Turkey EU. Moreover, sociologists have documented an incredible unity of views of respondents: almost equally men and women voted against, the upper and lower layers of voters, the centrists, the right and leftist. As for France, there is the growth of anti-Turkish sentiment observed steadily since 2003, with the right dislikes inspired by National Front which is not so much surprising (8% - for the introduction of Ankara, 92% - against), and now this trend has reached and leftists (27% pro - of 74% - against). No wonder that Hollande was so cautious speaking in Turkey on the main question of relations between Ankara and Brussels. The arguments of supporters and opponents of Turkey`s accession to the Union have long been known. The first comes from the perspective that the EU is able to obtain from the integration with Turkey: politically (the spread on Turkey of European values, the opportunity to influence the Middle East and the Caucasus), economically (including the EU-tenth of the world economy, access to energy sources of Asia) military-strategically (integration with the Turkish army - the second force in NATO crisis management at the borders of Europe). Turkey, on the other hand, will be able to receive the European market and to modernize, increasing their standard of living to the level of the EU. The Pro-Turkish does not confuse of neither geographical (for instance, 5% of the territory of Turkey is in Europe), or religious (main population of Turkey are Muslim nation) factors. Europe is meant to be not only as a regional but as a universal project. Such constructions frighten opponents of Turkey`s accession to the EU. On the basis of the risks they bring their arguments for each of the areas. Is Europe ready to get in 2019 about 81 million people (as much as the population of the largest EU countries - Germany, and eventually more), and who are mainly Muslims? In accordance with the rules of the EU institutions in case Ankara would get a majority in the European Parliament and it could become a key player in the Union. Can Brussels’ "swallowing" of Turkey take on crisis management at its Asian borders? Moreover, as experts point out, "a combination of demographic and economic weakness will make Ankara largest recipient of EU aid." Given the number of Turkish citizens (75 million now and forecast for 2020 - more than 81 million people), low per capita income (43.3% of the EU average), and a significant proportion of agricultural workers (for instance 24.6% - in 2008 was in Poland - 20%, while the EU average - 5.4%). Thus, in the case of Turkey’s joining, the European Union will be entitled to annual payments under the Common Agricultural Policy in the amount of 11.3 billion euros, which is more than the ten countries that joined the EU in 2004 (9.8 billion euros). Not to mention the fact that large-scale migration of the poor in the EU Turkey will strengthen competition in the European labor market. In addition, Turko phobias’ emphasize the loss of European identity. Leading European politicians talked about this trend during the preparation of the European Constitution. Former Chancellor Helmut Kohl called Turkey a country of a different civilization, and the head of the Convention for the preparation of the European Constitution and former French President Valery Giscard d`Estaing shocked everyone by saying that Turkey`s accession would be "the end of Europe." However, in Turkey itself number of euro-skeptics is growing. In 2005, at the start of negotiations between Ankara and Brussels for the accession to the EU were 80% of Turks. In 2013 these trend contributed no more than 40%. Obviously, the long and endless drift of the country to nowhere tires Turkish side, reducing the motivation to carry out reforms. "Why, in fact, to give as much importance to Europe in crisis, when China`s economic growth is observed? When Turkey`s relations with the great powers are self-worth on their own: it has historically good relations with the US and Russia who are on the rise," - such opinion on the perception in Turkey, announced in December 2013, by K. Dervish, former Turkish economy minister. Of course, one-sided lapel of Turkey from Europe is difficult to expect, because EU reforms allow Ankara not only to confront radical circles, but also to build a positive image in the eyes of the population of the neighboring Muslim countries. Yet misunderstandings between EU and Turkey can become a brake on European initiatives for Ankara.